A leave-in treatment for dull, lifeless thirsty hair, that combines long-lasting hydration with body-building ingredients to restore hair vibrancy, bounce and shine! 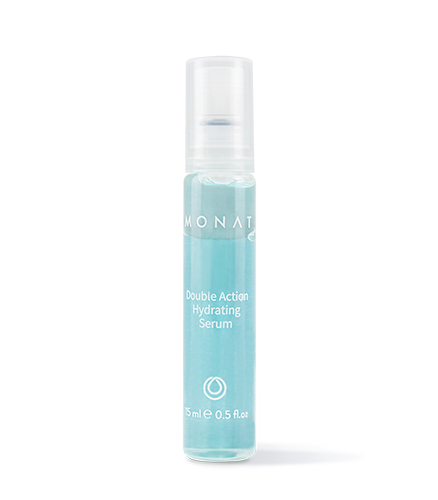 To learn more about Double Action Hydrating Serum, please contact your MONAT Market Partner. This high performance, intensive leave-in treatment consists of three treatment vials. Each vial contains a bi-phase formula comprised of a water phase with an oil phase sitting on top. Fueled by hyaluronic acid-based technology and body-building Panthenol (pro-vitamin B5), each phase is supercharged with the most powerful, highest concentrated assortment of active ingredients, including MONAT’s newest exclusive activated oil innovation–REJUVENIQE S™. This serum is no light weight! Looks can be deceiving. Don’t let the fluid, ultra-lightweight texture fool you. In fact, it is our advanced hydrating super star! With just a few quick shakes, the two phases become one, transforming the contents of each vial into a milky hydrating power surge, ready to quench thirsty hair strands with moisture replenishment from the inside-out. Each light spray application of Double Action Hydrating Serum transforms dull, lifeless, parched, thirsty hair strands into beautiful healthy-looking tresses, radiating with improved body, bounce and shine. This gentle, yet potent serum is one of those hair-saving essentials you won't want to go without. Helps boost and maintain optimal hydration. Improves hair elasticity to help prevent damage caused by external factors, styling, etc. Hydrates within the hair cuticle and all along external shaft – for inner/outer Double Action Hydration. Light, pleasant, easy-to-use spray application. Absorbs quickly without stickiness, flaking or dulling the hair. Dual-phase formula mixes quickly for application. Increased hydration helps improve hair’s elasticity to help prevent damage and breakage. Non-oily, non-greasy formula; fast absorbing. Compatible with all MONAT haircare products. Reusable hair treatment cap included. Ideal for all hair types, even oily hair. Improved immediate and long-lasting hydration up to 72 hours. Boosts immediate hair hydration, providing 195% hydration upon first application. Increases luminosity and shine 53%. Hydrates within the hair cuticle and all along the external hair shaft for inner and outer hydration, improving hair elasticity, suppleness and resilience. *Based on the survey results of an independent product usage study completed by 25 subjects, ages 24 to 60 years, applying the Double Action Hydrating Serum 1 time per week over a 3-week period. Shampoo and towel-dry hair, leave damp. Shake one vial until thoroughly mixed. Section hair and spray the serum evenly along each section from root to tip. Use ½ vial on short/medium hair; up to one vial for long or extremely thick hair. Massage entire head to distribute serum evenly. Apply cap and wear for 5-10 minutes, for best results do not rinse and leave in. Product may be rinsed out, if desired. Use for 3 consecutive weeks each month. May also be used 3-days in a row for more intensive hydrating benefits. 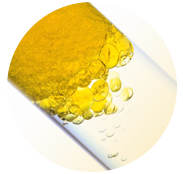 Aqua/Water/Eau, Isononyl Isononanoate, Betaine, Sodium Hyaluronate, Limnanthes Alba (Meadowfoam) Seed Oil, Crambe Abyssinica Seed Oil, Camellia Oleifera Seed Oil, Solanum Lycopersicum (Tomato) Seed Oil, Daucus Carota Sativa (Carrot) Seed Oil, Citrus Limon (Lemon) Peel Oil, Citrus Aurantifolia (Lime) Oil, Citrus Aurantium Bergamia (Bergamot) Fruit Oil, Adansonia Digitata Oil, Mauritia Flexuosa Fruit Oil, Cocos Nucifera (Coconut) Oil, Gardenia Taitensis Flower Extract, Moringa Oleifera Seed Oil, Caryocar Brasiliense Fruit Oil, Helianthus Annuus (Sunflower) Seed Oil, Olea Europaea (Olive) Fruit Oil, Simmondsia Chinensis (Jojoba) Seed Extract, Tocopherol, Panthenol, Glycerin, Trehalose, Urea, Serine, Pentylene Glycol, Glyceryl Polyacrylate, Algin, Caprylyl Glycol, Pullulan, Pisum Sativum (Pea) Extract, Disodium EDTA-Copper, Disodium Phosphate, Potassium Phosphate, Citric Acid, Fragrance/ Parfum, Sodium Benzoate, Potassium Sorbate, Benzyl Alcohol, Ethylhexylglycerin.